A low-income housing development in Detroit’s Brightmoor neighborhood promised tenants a path to home ownership. But after nearly 20 years, Brightmoor Homes tenants say the developer hasn’t honored that promise once yet. And they want their landlord to fire its current property management company, which they say routinely fails to make home repairs and leaves some homes in dangerous condition. Soummer Crawford leads Brightmoor Homes tenants and supporters in a protest outside the Detroit offices of KMG Prestige. They want developer Northwest Detroit Neighborhood Development to fire KMG as its property management company over a slew of resident complaints. 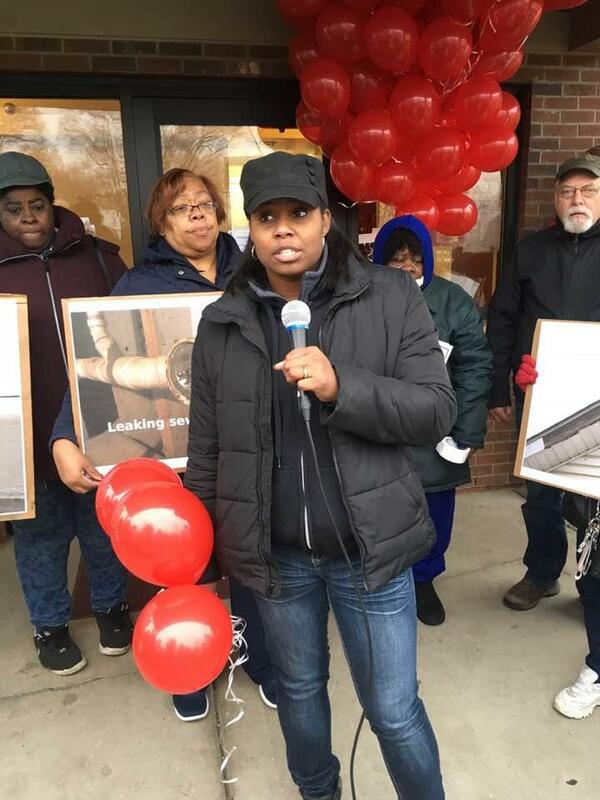 A handful of the project’s roughly 200 residents protested that and other instances of what they call disrespectful treatment outside the Detroit offices of that management company, KMG Prestige, on Saturday. They posted a symbolic eviction notice on the building’s door and carried clusters of red balloons. KMG has used red balloons tied to mailboxes as a public late-rent notice, another move that aroused anger among Brightmoor Homes tenants. Resident Soummer Crawford led the event. She’s lived in her home since 1999, but still doesn’t own it, even though the rent-to-own agreement was supposed to lead to a deed after 15 years. The development initially billed as the Westwood Park Project was meant to revive the ailing Brightmoor neighborhood with new, affordable low-income housing. The development was funded with federal tax credits, the city of Detroit, and other public and nonprofit sources. But it ran into financial problems as foreclosures further decimated Brightmoor and property values plummeted even further. Crawford says residents have suffered as the project’s owner and developer, Northwest Detroit Neighborhood Development, has broken nearly all its promises over the years. “It’s a lot of delays, a lot of excuses, and no accountability,” she said. Crawford says the city of Detroit has taken some steps to intervene on the tenants’ behalf, providing home ownership courses and promising appraisals and inspections so qualifying tenants can finally buy their homes. But while appraisers did come out in October, Crawford says the promised inspections never happened. Nor have participants who completed the home ownership course received any word from the nonprofit that ran it. Four-year tenant Karla Davis is most concerned about maintenance issues. Davis says it took far too long to fix her gas-leaking furnace, and she hasn’t had a working stove for weeks. Her bathroom floor is also rotting away, but she says repairs are slow to happen and often shoddy even when they do. Davis says that management can be efficient—when it wants to be. “They can throw you out real quick, they can collect that money real quick, but when it comes to the maintenance, that’s the bad part,” she said. Davis says some tenants have also seen their rent spike without notice. She also called on Northwest Detroit Neighborhood Development to fire KMG, and the city to make sure land contract agreements are honored. Neither KMG Prestige nor Northwest Detroit Neighborhood Development could be reached for comment Saturday. A group of housing activists hopes to organize land contract buyers in Detroit and other cities. Land contracts have been around for a long time. If you can’t get a mortgage, they can look like a good alternative to becoming a homeowner. You put some money down, and pay the owner of the house in installments over time. BRIDGE MAGAZINE: How to cash in on a crappy home. Step one: Find a sucker to sign a land contract.